A new growing season is here, and City Fruit would like to kick it off with a celebration at Santoro’s Books in Phinney with Amy Pennington, Urban Pantry cook book author and gardening expert. 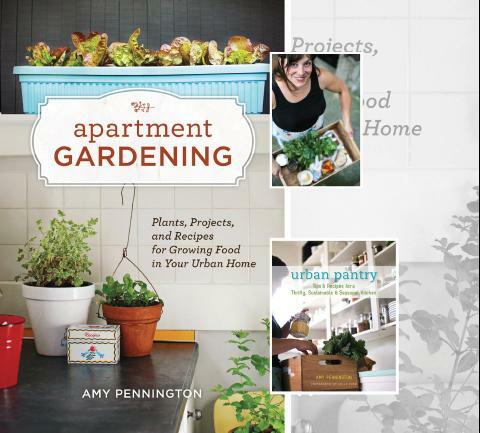 Ms. Pennington will kindly sign her newest book, Apartment Gardening: Plants, Projects and Recipes for Growing Food in Your Urban Home. In addition to her books, Amy is well-known for launching UrbanGardenShare.org and for her business tending edible gardens for Seattleites. Please join City Fruit board members, a representative from the Greenwood Food Bank, volunteers, and a slew of supporters as we share an update on our activities for this year — including plans to expand the fruit tree stewards program, running our two neighborhood harvests, and growing our roster of tree care and canning classes. We will have light munchies, wine and beer. The event is free, but without your generous contribution we will not be able to match (or exceed!) last year’s harvest of 10,000 pounds of fruit. Please consider what it means to low-income families in our community to have access to fresh, nutritious, local fruit. A portion of all proceeds will go towards supporting City Fruit. What time: 6:30 – 8:30 p.m.
Where: Santoro’s Books, 7405 Greenwood Ave. N.
City Fruit will be hosting two Summer Fruit Tree pruning classes in Seattle this summer. These are hands on classes taught by some of the most experienced teachers in the area. To register: click on the link of the class you want to attend (These link to the class registration at Brown Paper Tickets). You can also send a check, with the name of the class and your contact information to City Fruit, PO Box 28577, Seattle 98118. Cost is $15 for City Fruit members, $20 for non-members. After registering, you will receive confirmation and the address of the class. If you can’t afford a class but really want to learn, email us at info@cityfruit.org. July 17 Summer Pruning, North Seattle. 10:30 am – noon. Summer pruning discourages excessive new growth and “can be used to slow down overly vigorous trees or trees that are too large” (P. Vossen). It is most effective between June and late September. Learn the proper techniques at this workshop located in a heritage urban orchard. Ingela Wanerstrand is the owner of Green Darner Garden Design, specializing in edible garden design and coaching. She has been pruning fruit trees professionally for 14 years and leads the urban agriculture guild of Sustainable Ballard. Donate fruit . . . If you have more healthy fruit than you need and would like to donate some of your harvest, contact Jen Mullen, Harvest Coordinator, at crownhill@cityfruit.org or (206) 352-9580. Help harvest fruit . . . If you would like to help pick fruit and deliver it to food banks and community centers, contact City Fruit at crownhill@cityfruit.org. Need fruit . . . If you or your organization need fruit and can’t afford to buy it at the market, contact City Fruit. Support us .. . Join us in building community and strengthening our local food system by becoming a member of City Fruit. See www.cityfruit.org/membership/htm. This project is funded in part by a Neighborhood Matching Fund award from the City of Seattle, Department of Neighborhoods. Aug 14 Summer Pruning, South Seattle. 10:00 am – noon. Summer pruning discourages excessive new growth and “can be used to slow down overly vigorous trees or trees that are too large” (P. Vossen). It is most effective between June and late September. This class mixes lecture with hands-on demonstrations in a south Seattle urban orchard. Bill Wanless is co-owner of brooke/wanless gardens, specializing in pruning of small trees, shrubs and vines. He is an ISA-certified arborist with 20 years’ field experience.